Some movies try to make social or political statements. Some are heaped in melodrama. The rarest kind of film though, are the ones that are just meant to be fun, and are. Yogi Bear is just such a movie, especially if you have, or watch it with someone with, a childlike sensibility. Based on the classic cartoon, best friend bears Yogi and Boo Boo are up to their old tricks of stealing picnic baskets in Jellystone Park. Yogi invents creative ways of stealing them and Boo Boo goes along to assist. All of this frustrates Ranger Smith, but the three are actually best friends. Attendance is down at the park and the local Mayor has decided to close the park and sell the land for logging, to balance the city budget. 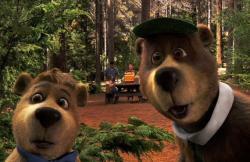 Yogi, Boo Boo and Ranger Smith join forces with a nature documentary film maker, to try and save the park. Tom Cavanagh and Anna Faris are in the thankless roles of playing second fiddle to the two animated stars. They each get a couple of good moments in as they fall in love. Cavanagh singing to Faris is his funniest scene, while Faris is great at keeping her slightly daffy character from becoming too absurd. Of course the real stars are the bears and they steal every scene they appear. True to the cartoon, they are talking animals that everyone who meets them accepts as ordinary. The bears repartee gives the films it's charm. "Kick it Boo Boo." Yogi says to his best friend, who turns on the boom box and replies, "Kicking it." The voice work is very close to the original. This raises two questions. If they sound just like they normally do, why hire two famous people to do their voices? I also wonder if Akroyd and Timberlake did their voice work cold, or were they digitally enhanced to sound like the original characters? Any answer to either question still implies that they were both just hired for name recognition sake. Yogi Bear could have been a big environmental message film, and it does almost go there. Thankfully, the film makers were more concerned with simply creating a nice little piece of family fun than a social statement. It only runs a brisk 80 minutes, but it does feature a brand new Coyote/Road Runner cartoon. 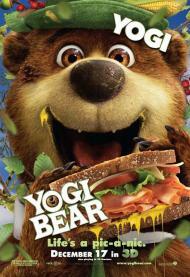 Be "smarter than the average bear" and take your kids to see Yogi Bear. As Eric suggests this one is strictly for the kiddies. My first question is why did they make this a live action movie with CGI bears? I mean who the hell thought that was a good idea? The central conceit of the talking bears is so ridiculous that it only works in an animated world. Between the two stars Dan Aykroyd fares better. He manages to capture the original Yogi voice while interjecting enough of his own flavor that I could recognize him. Justin Timberlake, as Boo Boo, proves that voice-over work is yet another talent he is blandly adequate at. Anna Faris is always hilarious and this movie is no exception. Despite the lame script she manages to be funny. The threat of her going “gorilla” made me laugh, which was a nice change of pace from the cringing I was doing throughout most of it. To be fair this isn’t a completely terrible movie. As characters Yogi and Boo Boo have their charms and I think it might have worked if they had made this an old fashioned cartoon. But since they didn’t I’d like to enter it as evidence. Exhibit A: just because we can do certain things with computer images doesn’t mean we should. Tom Cavanagh and Anna Faris in Yogi Bear. Holy crap Eric, you were in a forgiving mood when you reviewed this movie! You refer to it as a nice little piece of family fun, but it's not a movie for the whole family, it's just a movie for very little kids. There is very little humor here for anyone over the age of 5. The writers clearly spent no time considering any grown ups who might be watching. The Hanna-Barbera animation studio dominated cartoons on television during the last half of the 20th century. They created, among many, many others, The Flinstones, The Jetsons, Scooby-Doo, Johnny Quest, Josie and the Pussycats, Super Friends, and of course, Yogi Bear. Many of their early characters used voices that were impersonations of famous actors of the day, such as Marlon Brando, Buddy Hackett and Phil Silvers. Yogi's voice was based on Art Carney and more specifically, on Art Carney's character Norton from The Honeymooners. This in-joke of the time would have been noticeable to most audiences of the day, but is one that will be lost on children today, who, if they heard Carney speak in an old rerun, might wonder why he was doing a Yogi Bear impersonation. This film was an unexpected hit at the time of its release, despite receiving nearly universal poor reviews (apart from Eric). Surely a large portion of the money must have come from adults taking their children to see it out of a sense of nostalgia. With that it mind, it certainly couldn't have hurt to throw those grown ups some slightly more sophisticated jokes. The best children's films and cartoons have jokes that work on many levels so that grown ups and kids can both enjoy them for different reasons. This is not a new concept as those old Warner Bros. cartoons from the 30s and 40s demonstrate. I agree with Patrick that this would have worked better as a fully animated movie. Having a "normal" world and then sticking in these two strange looking bears just seems odd. And I know that it's just a children's film and I shouldn't be looking for explanations, but Yogi and Boo Boo can talk and no one acts as if this were weird. Can all animals talk in this world? If not, isn't that enough of a draw to bring people to Jellystone? Making the whole film a cartoon would have made this seem less weird. Of the cast, Anna Faris is definitely the standout. She's cute and charming enough to make even her dumbest lines at least mildly amusing. I also wonder why they bothered to hire Aykroyd and Timberlake apart from the name recognition. Since they're both doing impersonations, it's not even obvious that it's them. Both of them have stated they were fans of the show as kids, although clearly Timberlake was watching it in reruns, so perhaps they expressed an interest in the roles, but the studio could have saved money by hiring unknowns and the film wouldn't have suffered at all. As a film aimed at very young children, perhaps it manages to entertain, and yes there were even a very few moments that made me chuckle, but overall this is a failed effort.